Happy Friday everyone! Man, I am SO glad this CRAZY week is coming to an end! I'm hoping that we have a good weekend and that next week is a breeze. I cannot take anymore drama! Anyhow, here's my card for this week's Friends With Flair post. Did you see the new kit released yesterday? It was pretty fantastic! Love Donna Downey and I love Unity. 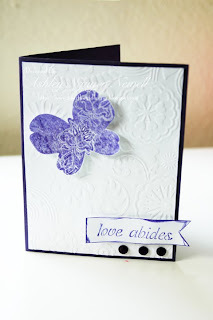 Anyhow, my card today is combined with the Moxie Fab Plum Crazy challenge. I used Bevy of Butterflies (I actually only have 2 stamps from this set that I traded with Rachel) and the Oct 09 KOTM for the sentiment. The background is the Cuttlebug Floral Fantastical folder. And the bling is from Michael's. Happy Friday everyone! I hope this weekend brings you happiness and joy! hey ashley! this is stunning as are all your creations. sorry i haven't left a comment, but i have been here! you don't think i'm gonna miss all this awesome work now do ya????? Where is that Easy Button when you need it? There were so many times I really could have used it when my girls were so young ~ heck ~ I could still use one!!! ASHLEY, I love how you used the butterfly! I love this CAS card. SO beautiful! Ashley, beautiful CAS card...hope all is well...do something this weekend for YOU! So pretty! I love the embossed background! Beautiful! Love this, Ash! Simply beautiful! its a beautiful CAS card., you did awesome. Cute card and congrats on being a EBTKS Diva. We loved your card! Very pretty card Miss Ashley!!! Ashley, this is beautiful!! Love this butterfly. love it Ashley. so soft and pretty! hope your drama ends soon! So pretty! I love that butterfly!